Big trucks may brag and roar, but small and steadfast wins the day in this cheerful story with timeless appeal. On the Mighty Mountain Road Crew, the trucks come in one size: BIG. That is, until the little snowplow joins the crew. None of the other trucks think that the little snowplow can handle the big storms, but he knows that he can do it—and just to be sure, he trains hard, pushing loads of gravel, pulling blocks of concrete, and doing plow lifts to get ready. But when a blizzard arrives, will the little snowplow’s training be enough to clear the streets and handle unexpected trouble? Taking its place beside classics such as The Little Engine That Could and Mike Mulligan and His Steam Shovel, this tale of a plucky little plow will find a clear path to readers’ hearts. Lora Koehler is a children’s librarian. The Little Snowplow is her first picture book. She lives near the mountains, in Salt Lake City, Utah, where snowplows of all sizes come in handy. Jake Parker is the illustrator of many books for young readers, as well as animated films and comic books. He also lives near the mountains, in Provo, Utah, and wishes the little snowplow would stop by his driveway every winter. There is a pleasing combination of Little Toot and The Little Engine That Could to the book, in both text and illustrations. Droll humor and excellent layout add to the fun. There's always room for another well-told yarn espousing the themes of small-is-beautiful, hard work pays off, and, of course, "I think I can." A story of hard work, determination, and graciousness, this picture book will reinforce to young readers that a strong work ethic and forgiving spirit will take one far...Reminiscent of The Little Engine That Could, this story is a modern take on a timeless message. 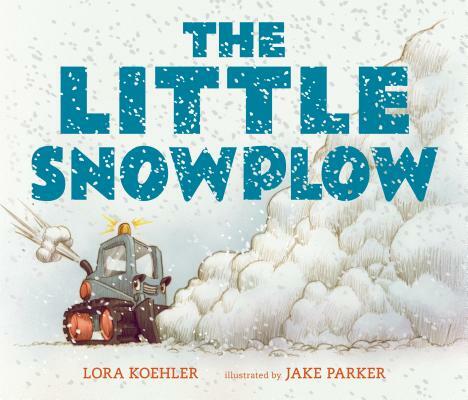 Debut author Koehler fills her story with vehicular action that will appeal to young gearheads (“The little snowplow plunged his plow into the avalanche debris”), while Parker’s illustrations balance cutely characterized trucks with mid-blizzard drama. Young children will find a lot to like in this picture-book adventure, from the insecurities of the stouthearted little protagonist to the way he earns the big trucks’ respect...A welcome addition to winter storytimes.